American pollsters suggest that it could be a tight race to the finish between Republican Donald Trump and Democrat Donald Trump. 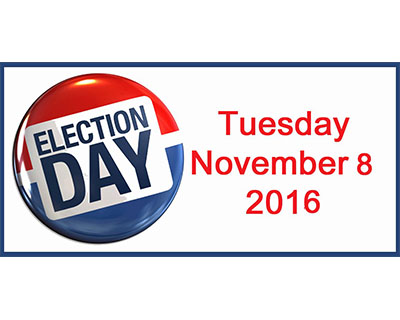 The voting to elect the 45th American president will take place on Tuesday, November 8. With less than a week left, Knappily examines the process of how the head of the most powerful nation is chosen and its drawbacks. 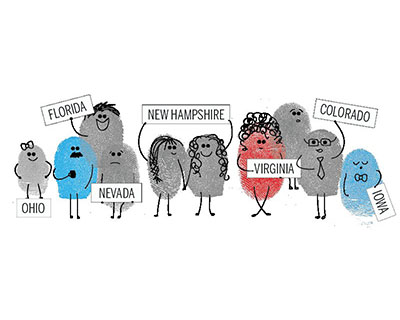 This is your definitive primer on US elections. An election for president of the US occurs every four years on Election Day, held on the first Tuesday after the first Monday in November. 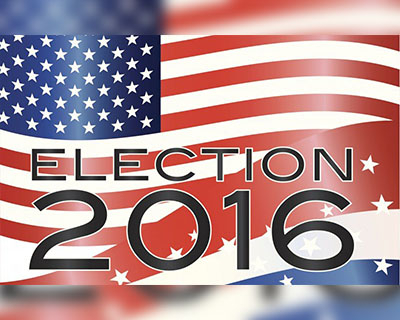 The 2016 Presidential election will be held on November 8. Some states allow early voting with some requiring to give an excuse for early voting. The period varies between four and fifty days prior to Election Day. The President and Vice-President are elected every four years. They must be at least 35 years of age, they must be native-born citizens of the US, and they must have been residents of the US for at least 14 years. Also, a person can be elected as President for only two terms. During the election, Americans from each of the 50 states and the District of Columbia head to the polls to cast their vote for President.But the tally of those votes (the popular vote) does not determine the winner. Instead, presidential elections use the Electoral College – a process by which the President and the Vice President is chosen by "electors". To win the election, a candidate must receive a majority of electoral votes. After the ballot is cast, the vote goes to a state-wide tally. In 48 states and Washington, D.C., the winner gets all of the electoral votes for that state - which means his or her party's electors in that state will vote in the Electoral College for the winning candidate. But for two states (Maine and Nebraska) the issue is a bit more complicated. They select one elector within each congressional district by popular vote and the remaining two by a statewide popular vote. A candidate needs the vote of at least 270 electors - 50 per cent plus one - to win the presidential election. Although the actual vote of the Electoral College takes place in each state between mid-November and mid-December, in most cases a projected winner is announced on election night.If none of the candidates can secure the 270-majority, the decision would go to the House of Representatives, which would vote to elect the new President. Why does America vote on a Tuesday of November? This choice of Election Day has to do with very specific considerations that Congress had in mind back in 1845 when it set a standardized voting day. Around then, America was a predominantly agrarian society. 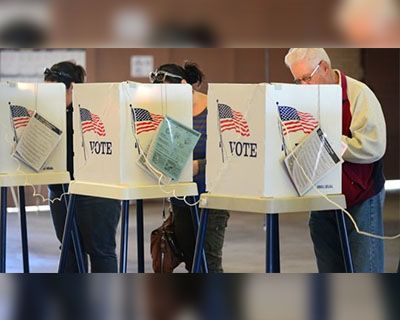 Lawmakers therefore took into account that November was perhaps the most convenient month for farmers and rural workers to be able to travel to the polls. The fall harvest was over, but in the majority of the nation the weather was still mild enough to permit travel over unimproved roads. Tuesday was chosen as most residents of rural America had to travel a significant distance to the county seat in order to vote, and Monday was not considered reasonable since many people would need to begin travel on Sunday. This would have conflicted with Church services and Sunday worship. The first Tuesday after first Monday was chosen so as to avoid the Election Day from falling on 1st of November. This was firstly because November 1st is All Saints Day, a Holy Day of Obligation for Roman Catholics. Secondly, most merchants were in the habit of doing their books from the preceding month on the 1st. Apparently, Congress was worried that the economic success or failure of the previous month might prove an undue influence on the vote! Essentially, Congress set up a day that would most accommodate a bunch of white, male farmers’ working, traveling, and religious practices. But a lot has happened since this hypothetical white male farmer was the primary American voter. 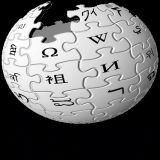 It is high time the US moves away from this system that is arbitrary and inconvenient in 21st century when major events have happened since 1845: the Industrial Revolution, women gaining the right to vote, the end of slavery, black people obtaining the right to vote, and, most recently, the invention of the internet. People no longer find a Tuesday in early November a convenient time to vote. Instead, voting on this day forces people to navigate around the standard Monday to Friday, 9 am to 5 pm schedule.Election Day has gone from convenient to very inconvenient. 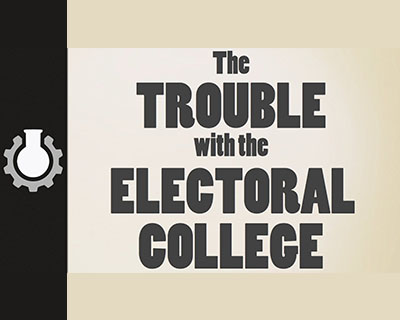 When does the Electoral College system appear to be less than perfect? Electoral College creates the possibility for the loser of the popular vote to win the electoral vote. This is more than a theoretical possibility. It has happened at least four times out of the 56 presidential elections. The most recent occurrence was in the year 2000 when George W. Bush received fewer popular votes (Bush: 50,456,062; Al Gore: 50,996,582) than Albert Gore Jr., but received a majority of electoral votes (Bush: 271; Al Gore: 266). It distorts the presidential campaign by incentivizing the parties to write off the more than 40 states along with the District of Columbia that they know they either can’t win or can’t lose. Among the states that, in recent history, don’t get campaign visits or TV ads are the three most populous states (California, Texas and New York, which among them make up more than 25 percent of the U.S. population), the geographically biggest state (Alaska) and the best state in voter turnout (Minnesota). It further distorts the presidential campaign by causing the candidates to grant extra weight to the narrow needs of the ‘swing states’ (where all the presidential campaign is focused). If Florida is to be carried to win, it elevates the need to gratify elderly voters, Cuban-Americans, orange-growers and any other group that can deliver a bloc of Floridians. For the same reason, it distorts governance. A first-term president who expects to have a tough reelection fight but who wanted to establish diplomatic and trade relations with Cuba (broken in 1960) would have to consider the possibility that such a policy might cost him Florida and therefore a second term. President Barrack Obama normalized relations with Cuba in his second term, though he could have easily done it in the first. 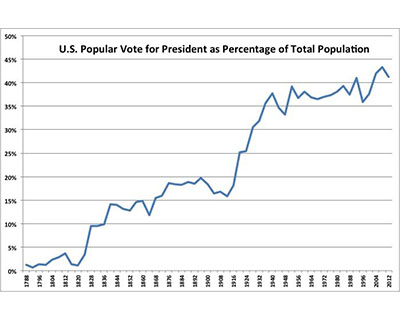 The Electoral College system further distorts the one-person, one-vote principle of democracy because electoral votes are not distributed according to population. Every state gets one electoral vote for each member of its delegation to the House of Representatives and each state also gets two “bonus” electors representing its two senators. This causes significant overrepresentation of small states in the “College.” In the most extreme case, using 2010 Census figures and the new distribution of House seats based on that census, an individual citizen in Wyoming has more than triple the weight in electoral votes as an individual in California. Where does the US election system appear to be rigged? The American system favors two major parties although technically any party can win the Presidential election. It is rigged to keep it that way. The only three U.S. Presidents without a major party affiliation were George Washington, John Tyler, and Andrew Johnson, and only Washington served his entire tenure as an independent. Neither of the other two were ever elected president in their own right, both being vice presidents who ascended to office upon the death of a president. All these three presidencies were prior to the civil war. The Republicans and Democrats have become the two major parties for over a century now and have used their power to make a third party winning the White House highly unlikely. The winner-takes-all system for presidential elections and the single-seat plurality voting system for Congressional elections have over time created the two-party system. As the voters don't get to rank their preferred candidates or have run off elections, voting for a third party is essentially a wasted vote. 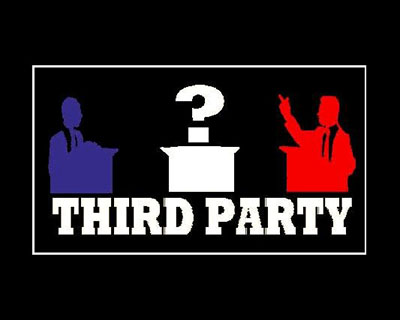 Third party candidates very rarely win any elections (not just Presidential, which they just can’t win). For example, such a candidate only won a U.S. Senate election twice (0.6%) since 1990. Therefore, it is very rare to have a national officeholder not affiliated with and endorsed by one of the two major parties. Note: In a plurality voting system, each voter is allowed to vote for only one candidate, and the candidate who polls more votes than any other candidate (a plurality) is elected. Who are the swing states this year? In principle, a candidate will have to run 51 separate presidential campaigns - one in every state - if he or she wants to maximize the probability of victory.But in practice, that is not the case. There are states that are reliably Democrat or Republican, based on the number of registered voters. In California, almost 45 percent of the voters are Democrats and only 27 percent are Republicans. In Texas, which has the second highest electoral votes at 38, Republicans edge out Democrats. So candidates usually skip those states, except for fundraising purposes. Instead, candidates concentrate on the so-called "swing states", where the Democratic and Republican registration numbers are almost even, or where there is a large number of "independent" voters, like New Hampshire. Other states that could swing either way based on demographics include Ohio and North Carolina. So most often in the 2016 race, Democrat Hillary Clinton and Republican Donald Trump have been seen campaigning in those states multiple times, as well as in Florida and Wisconsin. The other swing states for 2016 include:Arizona, Georgia, Iowa, Michigan, Nevada and Pennsylvania. How do we explain why most Americans do not vote? American voters rank among some of the least active in the world, particularly among developed countries. In 2012 only 54.9% of those eligible to vote turned up. Compare that with the last elections held in several countries:82.6% in Sweden, 80.3% in Denmark, 71.2% in France and 62.1% in Canada according to Pew Research Center. For decades, most political journalists and candidates seeking public office have assumed that those with more education, those with higher incomes, and those who are white, older, married or own a home comprise the nation’s most reliable set of voters. They show up and vote in relatively substantial numbers while registered lower-income and minority voters don’t. This is explained by political scientists as these are the voters with the most time, the most at stake, and the strongest sense that their opinions and priorities matter. However, there are also some significant policies and practices that also shape voter turnout. A dozen U.S. states either deny voting rights to convicted felons or require convicted felons to petition a court for the restoration of voting rights. The Sentencing Project, a research and advocacy organization, estimates that at least 2.6 million Americans cannot vote because of these laws. The majority of those affected are black or Latino. Additionally, more than 20 states have voter-identification laws — rules requiring registered voters to supply specific forms of identification at polling sites before they can cast a ballot. To obtain such identification, voters may be required to visit state-run agencies during times when they are scheduled to work – and sometimes fees are involved in order to obtain identification. The majority of who get affected comprises of voters of color. Election Day in the United States is not a national holiday, and voting isn’t compulsory. The public officials who organize elections typically assign voting machines, polling-location staff and other resources based on past voting patterns. This means the wealthier white neighborhoods in which voter turnout is consistently larger have more voting machines and on-site staff, which results in shorter lines and wait times. These voters also more likely to work on salary, so they have the luxury of still being paid if they miss work in order to vote. Workers who are paid an hourly wage might not have time to wait in long lines, which can make voting a difficult task. They have to forgo pay in order to vote.Again, a disproportionate number of Latinos and blacks work for hourly wages and hence are most affected.